Nok Air is planning more rapid expansion in 2014 as the Thai Airways low-cost affiliate looks to cement its leading position in Thailand’s domestic market and diversify its network with new international destinations. The expansion comes as competition significantly intensifies in Thailand with the launch of two new short-haul LCCs. Nok plans to add at least four 737-800s in 2014, giving it a fleet of 18 to 20 737s by the end of 2014. The carrier’s regional fleet will also be renewed as two recently ordered Bombardier Dash 8Q400s are delivered in 4Q2014. Nok is predominately a domestic carrier and currently only operates international services to neighbouring Myanmar. But the now publicly listed company is keen to add more short-haul international routes and also plans to expand into the medium/long-haul sector in 2H2014 following the establishment of a new joint venture carrier with Singapore Airlines long-haul LCC subsidiary Scoot. Nok currently operates a fleet of 14 737-800s and two ATR 72-500 turboprops on 15 domestic routes and to Yangon in Myanmar. Nok plans to resume service from Bangkok to Krabi on 1-Jan-2014, giving the carrier 16 routes under the main Nok brand. The carrier also wet leases five Saab 340 turboprops, which are operated by partner carrier Siam General Aviation on nine other domestic and two international routes under the sub-brand Nok Mini. Notes: Blue dotted lines represent air to ferry connections. Red dotted lines represent air to bus connections. 2013 has been a landmark year for Nok. In the second half of the year it phased out its last 737-400 and also returned its two older model ATR 72s, giving Nok a much younger fleet with an average age of less than nine years. Nok took its first 737-800 at the end of 2011 and added seven of the type in 2012 and another six in 2013, according to the CAPA Fleet Database. All but one of Nok’s 737-800s have been leased as second-hand aircraft but still provide a huge boost of efficiency over the ageing 737-400s, which were over 20 years old. 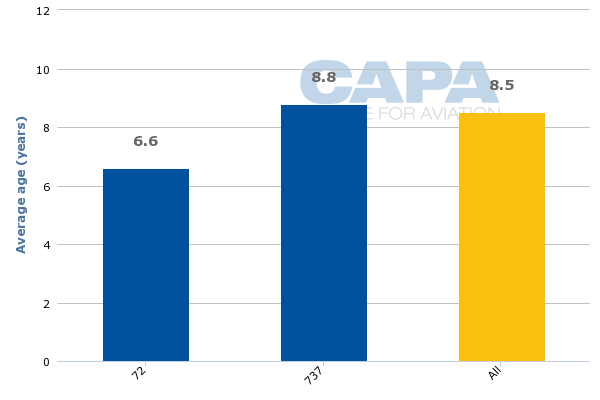 The two six-year old ATR 72s which Nok placed into service in 1H2013 are also more efficient than the two over 20-year-old ATR 72s which were recently returned to parent Thai Airways. Nok’s fleet will get even younger in 2014 as two new Dash 8Q400s are delivered and the carrier takes new rather than second-hand 737-800s from leasing companies. In Nok’s history it has taken just one new aircraft, a 737-800 that was leased from GECAS in early 2013. A Nov-2013 purchase agreement with Bombardier for two Q400s plus two options was Nok’s first aircraft order although the carrier is now looking at placing a much larger order for next-generation 737 MAX aircraft. The replacement of 737-400s, which were configured with 150 to 168 seats, with larger 189-seat 737-800s has also enabled significant capacity growth. ASKs, RPKs and passenger figures for the first nine months of 2013 were already higher than the total figures for 2012. ASKs were up 46% in the first nine months of 2013, building on 30% capacity growth for the full year in 2012 and 49% growth in 2011. Passenger numbers for the first nine months of 2013 were up 45% to 4.3 million, exceeding an already rapid growth rate of 32% growth for the full year in 2012 and 41% for the full year in 2011. Nok capped the year off by inking on 13-Dec-2013 a memorandum of understanding with Scoot to establish a new medium/long-haul low-cost carrier. NokScoot plans to launch services in 2H2014 with an initial fleet of two 777-200s operating between Bangkok Don Mueang, where Nok is based, and destinations in North Asia with a focus on Japan. Nok also has had a successful year financially. Through the first nine months of 2013, Nok recorded a profit of THB921 million (USD28 million), representing a 136% improvement over the same period of 2012. Revenues were up 40% to THB8.216 billion (USD251 million). Nok has been Thailand’s most profitable carrier in 2013. Nok’s 11% net margin for 9M2013 was 2ppt better than the 9% margin recorded by rival Thai AirAsia and is one of the highest margins among publicly traded airlines in Asia. Profits for Nok and other Thai carriers will slip in 4Q2013 as a result of the recent political turmoil in Thailand, where frequent protests in Bangkok in late Nov-2013 and throughout Dec-2013 have impacted demand during what is usually a peak travel period. But Nok still expects to remain in the black for 4Q2013 and will post a strong annual profit, beating its profit from 2012 and extending its annual streak of profits to five consecutive years. 2014 will be another year of milestones for Nok. The carrier will celebrate its 10th anniversary on Feb-2014, making it one of Asia’s oldest (but lesser known) LCCs. Nok also has one of Asia’s longest serving airline CEOs in Patee Sarasin, who has been with Nok since its launch and is also a large shareholder. Mr Patee tells CAPA that carrier will grow its fleet in 2014 by four to six aircraft. Nok’s current fleet plan has four additional 737-800s in 2014 followed by another four of the type in 2015 for a total of 22 by the end of 2015. But Mr Patee says Nok is now seeking to accelerate fleet expansion by leasing two to three additional 737-800s in 2014 and 2015 for a total of 24 to 25 aircraft by the end of 2015. He says an order directly with Boeing may also be placed in 2014 covering 737-800 deliveries from 2015 or 2016 as well 737 MAX deliveries from about 2018. Nok also plans to take delivery of two Q400s in 4Q2014, providing growth opportunities on regional routes as the Q400s, which will be configured with 86 seats, are faster and larger than its 72-seat ATR 72s. Mr Patee says Nok will look at acquiring another two Q400s depending on the initial performance of the aircraft. He says the two ATR 72s, which were only leased about a year ago, will be returned after the Q400s are delivered with assistance from Bombardier. The forthcoming 737-800 expansion will enable further domestic growth with a focus on existing routes as well as expansion of Nok’s limited international network. Nok plans to re-enter the Thailand-Vietnam market by the end of 2014, with services from Bangkok to Hanoi and Ho Chi Minh. The carrier also has earmarked three China routes and three more Myanmar routes in its network plan – including Bangkok to Chengdu, Nanjing and Xian and from Chiang Mai in northern Thailand to Bagan, Heho and Mandalay. Some of these routes may not be launched until 2015 and some of the Thailand-Myanmar routes may be operated with regional aircraft. Nok will also have to grapple with some of its biggest challenges in 2014. Competition in Thailand has increased significantly following the 4-Dec-2013 launch of Thai Lion, which is currently competing against Nok on the Bangkok-Chiang Mai route and plans to launch several more routes in 2014. Thai VietJet also plans to launch services in 2014, giving Thailand five narrowbody/short-haul LCCs along with Nok, Thai AirAsia, Orient Thai and Thai Lion. Thai AirAsia has also been accelerating expansion, using proceeds from its 2012 IPO. 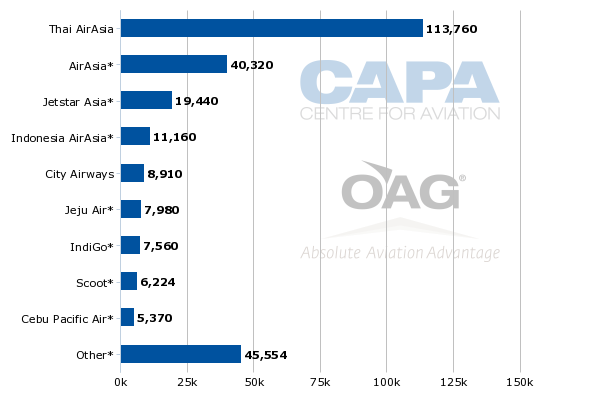 The carrier expanded its all-A320 fleet by eight aircraft in 2013 from 27 to 35 aircraft. Thai AirAsia plans to add another eight A320s in 2014 and end 2014 with 43 aircraft. With Nok about to launch service to Krabi and Thai AirAsia having recently launched service to Phitsanulok, the two carriers now compete against each other on virtually all of the main domestic routes. Thai AirAsia has more frequencies than Nok on most big trunk routes, including Bangkok to Phuket and Chiang Mai. But Nok has a bigger domestic network, with 25 routes compared to 18 for Thai AirAsia. The bigger network is made possible by Nok’s regional operation, which gives the carrier access to smaller airports and enables thin point-to-point routes. Nok claims that based on Airports of Thailand and Thailand DCA data it has inched ahead of Thai AirAsia with a 27.2% share of the domestic market for 9M2013 compared to a 26.9% share for Thai AirAsia. Thai Airways had a 29.9% share when also including its regional unit Thai Smile. Full-service independent boutique carrier Bangkok Airways captured a 14.5% share of the market in the first nine months of 2013 while small LCC Orient Thai accounted for the remaining 1.6%. Bangkok Airways also is now pursuing domestic expansion as it expands its A320 fleet and enters routes such as Bangkok to Udon Than and Chiang Rai, which have been a stronghold for Nok and Thai AirAsia. While rapid expansion over the last couple of years has enabled Nok to emerge as roughly an equal to Thai AirAsia in the domestic market, Thai AirAsia is still a much bigger international carrier. Thai AirAsia currently serves 25 international routes compared to three for Nok and allocates about 40% of its seat capacity to the international market compared to about 2% for Nok. The AirAsia brand will significantly increase its presence in the Thailand international market in 2014 through the launch of new affiliate Thai AirAsia X, which will initially operate routes from Bangkok Don Mueang to North Asia and Australia. While NokScoot will compete against Thai AirAsia X in Thailand’s emerging medium/long-haul LCC sector, Nok Air will look to close the gap with Thai AirAsia in the regional international market. The AirAsia brand currently accounts for over 60% of LCC capacity in Thailand’s international market and about 50% of LCC capacity domestically. See related report: AirAsia X multi-hub strategy to shake up Thailand market from early 2014. Is Indonesia next? The Nok brand currently accounts for about a 1.5% share of international LCC capacity in Thailand. This will expand as Nok Air adds destinations in Vietnam and southern China and as NokScoot launches services to North Asia and Singapore. But Nok Air will never match Thai AirAsia’s large regional international network as its focus will remain primarily on the domestic market with a relatively small number of international flights that will be operated in part to feed NokScoot. Nok for example does not plan to enter the Thailand-Indonesia and Thailand-Malaysia markets, where it sees potential over-capacity due to the intense competition between the AirAsia and Lion groups. Jakarta and Kuala Lumpur are the initial international routes for Thai Lion, which currently operates two 737-900ERs on one domestic and two international routes. Thai Lion plans to pursue expansion in both the domestic and international markets in 2014 as it adds another eight 737s. Domestic routes planned for early 2014 include Bangkok-Hat Yai, Thailand’s third largest domestic route, and Chiang Mai-Phuket, a point-to-point route which had been un-served until 15-Dec-2013 when Thai AirAsia entered. Nok believes Thai Lion will have a bigger impact on Thai AirAsia as the AirAsia and Lion groups appear to be picking on each other, with Thailand the latest battleground to emerge following Indonesia and Malaysia where both groups also have affiliates. Thai Lion’s initial network overlaps with AirAsia on all routes while there is less overlap with Nok. Thai Lion also has decided against adding ATR 72 turboprops, which the Lion group uses in Malaysia and Indonesia to access smaller regional airports. Thai Lion’s decision to stick with 737s allows Nok to continue being the only LCC in Thailand with a regional operation, which gives it a USP in the country’s increasingly crowed LCC sector. While competition is increasing, the long-term outlook for Thailand’s LCC market remains relatively bright as Thailand continues to be the largest destination market in Asia. Local demand is also on the rise as Thailand’s middle class continues to expand while the price of air travel drops. Mr Patee says Thai Lion’s entrance on Bangkok-Chiang Mai, Thailand’s largest domestic route, with very low fares has expanded the total size of the market and has led to fewer people taking the bus rather than led to a reduction in traffic for the incumbents. Mr Patee says December traffic was impacted as most Thais decided to stay in Bangkok for the demonstrations, including over the end of the year holiday season, rather than travel. But he says Nok is still doing “OK” and is confident demand will recover in January or February. Over the last decade Nok has developed a strong position in the local Thai market with a powerful brand, well respected product and innovative distribution strategy. Nok will look to leverage this position as it encounters more intense competition domestically and starts to expand in the international market. There will be challenges and over-capacity could result on some domestic and international routes as new LCCs enter the market and all the existing carriers respond by pursuing rapid expansion. But Nok should be able to ride out the storm and benefit over the long-term from having first mover advantage in what has emerged as one of Asia’s most competitive markets.